Rocio Durcal and Jenni Rivera in Mazatlán | ¡VidaMaz! God bless the drag queens! The Miss Universo Carnavál Mazatlán beauty pageant was last night, and we thoroughly enjoyed attending. I had no idea we had so many queens in Mazatlán! 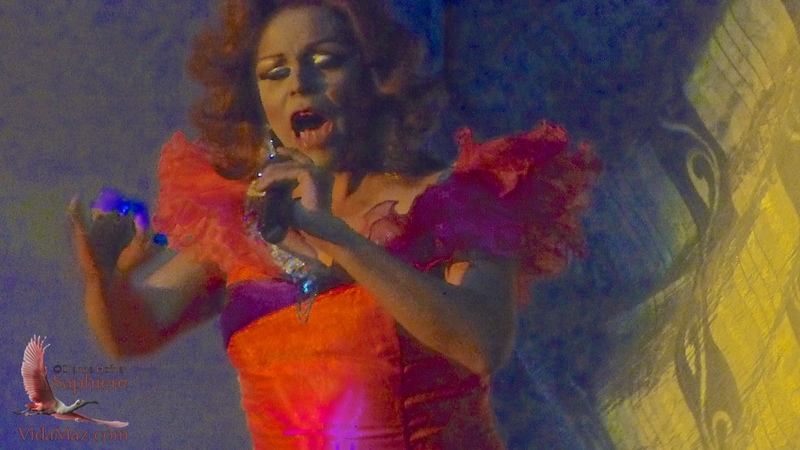 The Diamond Show Center in Olas Altas was filled, the huge lineup of judges included several of our expat favorites, and past, present and future queens were on hand—as were Rocio Durcal and Jenni Rivera (impersonators in drag)! I have long wanted to attend this event, but 2015 is the first year I’ve been able to do so. It was much more serious/low-key than similar events I’ve attended in Tokyo, Frankfurt, or San Francisco, and naturally so. I was warmly accompanied by a bevy of non-drag beauties, who hung out with me prior to and during the show. Ms. Ginger wrangled us primo seats as well, between the dressing room and the stage. Sadly for me, my camera battery died very early on in the evening, so many of the photos you see are taken with my old cell phone. We had a drink at Copa de Leche and were able to watch as many of the show’s stars arrived. It felt like being on the red carpet! “Beauty with a Purpose” organizes this annual fundraiser. Last night’s pageant was in benefit of this beauty, who is suffering facial paralysis. Past fundraisers have supported cancer and HIV patients, as well as those with heart conditions. The Diamond Show Center is spacious and comfortable, and our service was outstanding! Thank you, Ramón! Winner of the competition last night was Ms. Puerto Rico, center in the photo below. She had a huge crowd of very loud fans, who waved flags and giant letters spelling out her name, Fany. Our table’s favorite was Ms. Colombia, in the photo below. She won “Ms. Personality.” You can see why. Thanks to Sandy, a talented photographer who had front-row judge seats, for permission to use both these photos! The winner of the evening, to me, was the beautiful queen who, in the midst of her song, started to strip off her garments, her wig, even her bra, to reveal the man’s body beneath! God bless him for the confidence to do that on stage; it brought tears to the eyes of many of us in the audience. I unfortunately do not know his name to share with you. Thanks to Susie for the pic below, which she was able to catch from her cell phone. 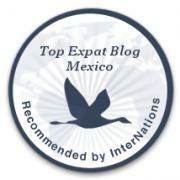 Bless Mazatlán for all its diversity, beauty, and incredible people! It is a privilege to live here. How very interesting. How many participants were there? One of my daughters has some friends that dress in drag regularly. It takes them hours to transition their looks, they spend lots of time shopping for clothes and shoes, etc. Lots of work put into it. Too bad about your battery. Indeed, Tom. I know to always take backup camera batteries, but I was thinking more “girls’ night out” than “blog post,” LOL. There were about 9 contestants if my memory serves. In addition there were at least 3 performers in drag, and perhaps a dozen or so other crowned queens attending to congratulate the winners. I can only imagine how long it takes to get all made up like that. I most definitely could use some lessons! I’m a makeup and clothing minimalist, and was born without the “shopping gene,” as I call it! Wonderful, thanks for taking the trouble to put the story and phoots together. I think it’s important for people to know about the wonderful things that go on around here, people helping people… Makes the world a bit brighter and more hopeful.